In the modern age of social media, people are increasingly more aware of their appearances and how it impacts on their daily life. Modern dentistry has adapted to these increasing demands, with the development of various “tooth coloured” options for restoring teeth to their natural form and appearance. The original white fillings which date back to the 1960’s had issues with strength and longevity. 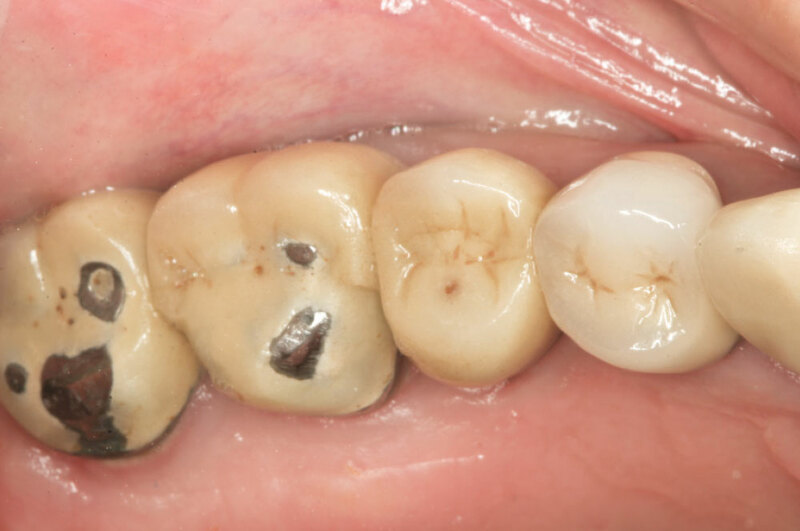 With the introduction of light curing, advances in bonding technology and the improvement in the composite resin material, white fillings, today have become a reliable alternative to silver amalgam fillings. 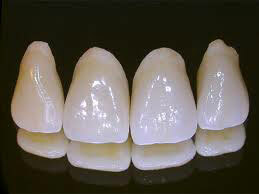 Dental crowns have also evolved over the years as cosmetic dentistry has become more important. Crowns originally were made from gold, but with the demand for something white, there was a move to porcelain fused to metal crowns. With these crowns, the metal provided underlying strength, whilst the porcelain provided for a white tooth-like appearance. However because there is metal under the porcelain there would sometimes be a dark shadow or ugly, black lines near the gum margin. 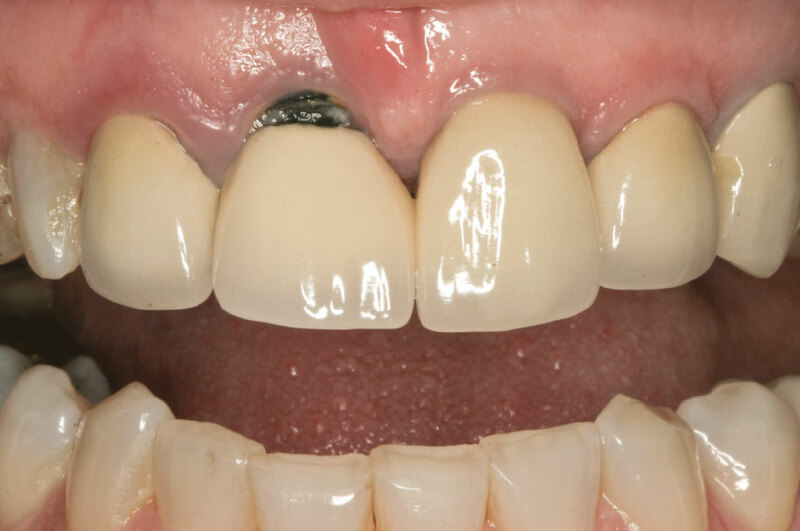 Often the metal would become visible if the porcelain chipped or wore thin (see images below). 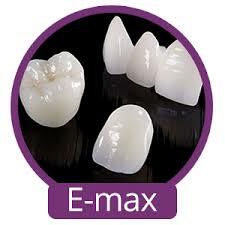 At Dr Lester Mark’s dental practice in Endeavour Hills, most crowns today are made from a new material called e.max or lithium disilicate which is a glass ceramic. The advantages of this material are that it is has no metal, yet is strong, has very similar appearance to tooth enamel and can be bonded to the tooth. This allows the crown to be thinner than porcelain fused to metal crowns, which means less tooth structure needs to be cut away when preparing the tooth. This results in a stronger tooth in the long term. As these crowns have no metal, they are more translucent than porcelain fused to metal crowns and have a more natural appearance. Porcelain veneers have become fashionable in recent times as a longer lasting solution to chipped front teeth or fillings. They can replicate the natural appearance of worn, decayed or broken teeth and can also help to align some minor crowding or crooked teeth to improve their appearance. Cosmetic dentistry is not just about teeth. The gums and their appearance are also an important part of a healthy looking smile. It is important to maintain clean teeth and healthy gums through daily brushing and flossing as well as periodic professional cleaning. Diseased gums can look red, swollen and detach from the tooth, leaving unsightly black spaces. Other important considerations in cosmetic dentistry today are advances in teeth whitening procedures and orthodontics, especially since the development of technologies like Invisalign. For enquiries about cosmetic dentistry whether it be about white fillings, porcelain crowns, porcelain veneers, onlays, bridges, teeth whitening or orthodontics, please call Dr Lester Mark’s dental practice in Endeavour Hills on 9700 6088 to make an appointment for a consultation. Teeth whitening has become a common treatment in recent years with much promotion in magazines and on social media. But not all teeth whitening procedures are the same……………. Wisdom teeth are the last permanent teeth to appear and are known as the third molars. They are positioned at the back of the jaws, and can appear as early as 16 years old or as late as 65 years old. Not everyone will have wisdom teeth but generally people have up to four wisdom teeth, two on the top jaw and two on the bottom jaw. Teeth are at risk of serious damage when playing sport, and a knock to the mouth without a mouthguard can result in broken teeth and injuries to the lips, tongue, face or jaw. Mouthguards help cushion blows that cause these injuries and can reduce the incidence and severity of concussion. There are two specific types of mouthguards, the custom fitted mouthguard (pictured below) and the ‘boil-and-bite’ or ‘over the counter’ mouthguard. Following several months of uncertainty regarding the future of the Medicare Child Dental Benefit Schedule (CDBS), the Federal Government announced in late December 2016 that the scheme will be continuing into 2017 in a somewhat different form.